On Wednesday, 1 June, I am honoured to host some of the most fascinating scholars working at the intersection of Indigenous philosophy and ecological crisis, both here in Canada and around the world, at the event Indigenous Visions of the Global Extinction Crisis . If you happen to be in the Waterloo area, please join us for the opening event, which will include Haudenosaunee remembrance and condolence ceremonies, a talking circle featuring workshop participants and all attendees, songs from the Waterloo Aboriginal Students Association and an art exhibition/ spoken word performance featuring the work of the very talented Cara Loft and Zoe Todd . This event will mark the beginning of a collaborative project that features contributions from (in alphabetical order): Tim Leduc, Genese Sodikoff, Makere Stewart-Harawira, Noah Theriault, Zoe Todd, Vanessa Watts and Sarah Wright (joining us on behalf of the Bawaka Country Research Collective) Special thanks also to my colleagues at the Office of Aboriginal Initiatives at Wilfrid Laurier University (especially Jean Becker, Melissa Ireland and Kandice Baptiste) for their guidance, input and teachings. I am grateful to the gifted (and tireless) Tahnee Prior for her help in organising the event, and to the Balsillie School of International Affairs, Wilfrid Laurier University and the Independent Social Research Foundation for funding this event. For those of you who can’t join us in person, I’d like to share an abridged version of my opening talk for the event, to give you a sense of the community and projects we are aiming to build. Please note that the text has been edited to remove personal and/or ceremonial aspects of the event out of respect for these people and traditions. This workshop marks the beginning of an ongoing, collaborative project, so please get in touch if you are interested in finding out more. Thank you so much for coming today. I am honoured that you could all join us for the opening of this new project, and I look forward to learning from and with all of you over the next hours and days .I hope that this will event will mark the beginning of many rewarding relationships and new collaborations. We’ll begin by acknowledging that we are on the traditional territory of the Neutral, Anishnawbe and Haudenosaunee peoples and offering a formal expression of gratitude to them as our hosts. … Before handing over to William Wordworth to begin the remembrance and condolence ceremonies, I’d like to say a few words about why we have come together for this few days of sharing, learning and envisioning. Western science tells us that the Earth is in the midst of a global extinction crisis. The biological extinction of life forms is accelerating rapidly and across the planet as a result of human activity. We are warned that this may be the beginning of a ‘6th mass extinction’ in which most existing life forms may be eliminated in a few centuries. Yet there is little discussion of what ‘extinction’ means – it is simply assumed to mean the death of ‘every member of a species’. There are so many problems with this definition: not least the Linnaean mode of classification that has given us the concept of species or the more recent construct of ‘biodiversity’, both of which exclude myriad forms of life and relations and draw sharp boundaries between ‘living’ and ‘dead’ that confound the basic principles of so many living cosmologies. Even the concept of extinction as the irreversible elimination of a life form effaces the ways in which relations ‘extinct’ life forms may continue through relations with the spirit world, through genetic entanglement, and through lived histories that extend across the imposed boundaries of ‘species’. Crucially, all of these concepts embed deeply colonial ideas of ‘nature’ and human relations with it – from the early roots of conservation in the creation of national parks and the violent eviction of their human inhabitants, to contemporary forms of hyper-capitalist conservation in which ‘species’ and ‘ecosystems’ are traded, offset and financialized as commodities, severing relations of kinship and care. These concepts furnished by Western secular science cannot capture the enormity of the global extinction crisis – and they mask the violent erasures that they create, including the crowding out of alternative accounts and ways of being-knowing. Talking to colleagues and friends from different Indigenous communities, I’ve learned how loaded the term ‘extinction’ can be: it evokes colonial beliefs that Indigenous peoples are ‘extinct’, or headed for extinction. I can’t think of a less appropriate way to describe communities whose powerful, collaborative acts of survivance in the face of waves of crisis and violence epitomises the vibrancy of life and strength. So, we need new terms, concepts and frameworks, but also stories, songs, images, dances, communities of intention – in a word, visions. These visions must be expansive enough – both in timescale, geographical scale and the complexity they can embrace – to address the global extinction crisis (or whatever we want to call it!) They must reach back into the deep, ancestral past – and far forward into plural possible futures, while remaining grounded in the everyday experiences of multi-species communities in which we are all, differently, enmeshed. They must address the entangled vulnerabilities of Earthly life, rejecting sharp distinctions between humans and nature, living and dead, tradition and modernity. What better place to look than the rich, vibrant multitude of living Indigenous philosophies and cosmologies?These cosmologies have survived, adapted and nurtured plural life-forms across millennia, negotiating and fostering life in the face of crisis. Indeed, for many Indigenous peoples, the apocalypse has already happened, with the advent of European colonisation. For several centuries, they have been responding, adapting and creating in the face of violence, rupture and destruction – not least the expropriation of their ancestral lands and the severance of their fundamental relations with specific places and beings. This workshop builds on the intuition that Indigenous philosophy and cosmology can offer radically different approaches to understanding the global extinction crisis. It rejects the Cartesian, rationalist logic of classification and scientific management, instead embracing plural understandings of how humans and other beings form, sustain and care for multiple worlds here on Earth. While ‘Traditional Ecological Knowledge’ – localizes Indigenous knowledge, Indigenous philosophies and cosmologies have much to offer in terms of wrestling with the global nature of this crisis, and should not be parochialized against the backdrop of apparently ‘universal’ Western scientific and governance perspectives. I certainly do not want to downplay the importance of connection to specific places and beings, but rather to explore the global significance of contemporary, living Indigenous thought. As Vine Deloria Jr and Rauna Kuokannen (amongst others) have argued, Indigenous knowledge tends to be instrumentalized, treated a source of empirical material that can be used to substantiate the claims of Western science and policy-making. Yet diverse bodies of Indigenous knowledge offer profoundly distinct cosmologies, frameworks, philosophies and spiritualities that are also abstract and transcendent, while remaining grounded in place and concrete experience. Moreover, the idea of ‘traditional’ knowledge imposes a linear, progressivist view of time which parcels it out neatly into past, present and future – and relegates Indigenous thought to the past. Instead, embrace multiple temporalities and are energised by Indigenous visions of multiple possible futures. Our goal in this project is to engage a wide range of forms of Indigenous knowledge in order to identify resonances amongst them – NOT to find one universal, over-arching theory. In so doing, we hope to generate new insights and visions for apprehending the multiple dimensions of the global extinction crisis, decolonizing the structures of knowledge that dominate the way it is discussed, researched and governed, and cultivate creative, visionary responses to it. The following images are from the exhibition “Cultural Projections” by Cara Loft. Cara is Aboriginal Recruitment and Outreach Officer for the Office of Aboriginal Initiatives at Wilfrid Laurier University. She is a Mohawk Woman from wolf clan and her home community is Tyendinaga First Nation. Cara holds a BA in Health Sciences and a postgraduate degree in International Development, with a focus on community development in First Nations communities in Ontario. She is an avid beader, a women’s traditional dancer and hand drummer. Cara is passionate about supporting aboriginal youth in Canada in all capacities possible, and her current work focuses on bolstering education, leadership & cultural pride. “Cultural Projections” highlights Cara’s experiences travelling through Aboriginal communities in Northern Ontario, with a focus on pathways and passages. Attawapiskat Catholic Church by Cara Loft. All rights reserved. Attawapiskat First Nation lies on the western side of James Bay. It is an isolated Cree community with a population of 1,549. Each December a Winter Road is constructed to connect the remote communities of Moosonee, Kashechewan, Fort Albany and Attawapiskat. Attawapiskat being the most northern and remote stop on the James Bay Winter Road. When driving on the Winter Road, the first view you see on the way into Attawapiskat in the Catholic Church sitting high on the hill top. This serves as a reminder of the colonization that took hold of the ‘People of the Parting Stone’ and continues to grip this community. This is reflected in the flagrant natural resources extraction from the open pit Victor Diamond Mine, located a mere 90 km from Attawapiskat. Beausoleil Ferry by Cara Loft. All rights reserved. Beausoliel First Nation is spread across three Indian Reserves, the one pictured here is Christian Island located in Georgian Bay. The peoples of Christian Island largely depend on the ferry system to move back and forth to the mainland; and also move supplies onto the island. Recently one of the main passenger ferries, the 57 year-old M.V. Sandy Graham, was deemed unsafe and had to have $500, 000 worth of repairs to make it usable again. The other ferry, the Indian Maiden, is also in need of repairs as well. Pictured here, we see a community member using their own barge to transport equipment to Christian Island. According to the UN Declaration on the Rights of Indigenous People’s: “Indigenous peoples have the right to the lands, territories and resources which they have traditionally owned, occupied or other-wise used or acquired.” Without access to a working ferry, the peoples of Christian Island are at risk of losing their traditional territory and way of life. Pike, Pic Mobert by Cara Loft. All rights reserved. Pic Mobert is an Anishnabeg First Nation community composed of two small reserves located along the White River in Ontario: Pic Mobert North and Pic Mobert South. These rural communities have roughly 400 band members living on reserve. 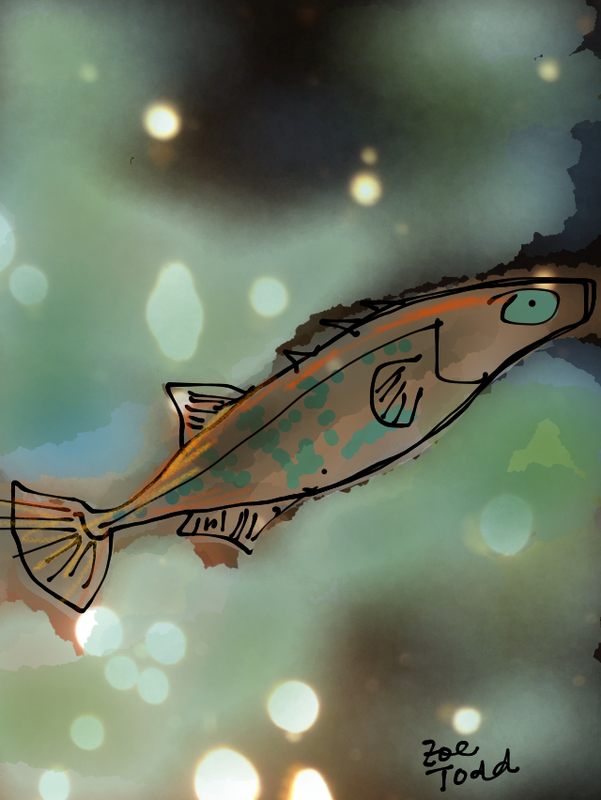 One of the staple foods in this community is the fish; providing both a practical source of food and cultural connection to the land and waters. Pictured here is a pike caught through the traditional practice of netting. An oasis in North Western Ontario; Pic Mobert is still considered an impoverished reserve without the proper health, education & social resources to address the issues within their communities. Despite these gaps, the cultural connection to land and water is strong and speaks to the resiliency of these communities. Serpent River by Cara Loft. All rights reserved. Serpent River is an Anishnabeg community located along the North Shore of Lake Huron. The traditional territory of these peoples extends from the North Channel of Lake Huron, to just past the city of Elliot Lake. In 1847, uranium was discovered near Elliot Lake prompting the Chief at the time to demand protection from mining exploitation. Thus began the era of natural resource extraction from the Serpent River territory. Today, Serpent River is a modest community of 373 on reserve band members that sits quietly on the banks of Lake Huron. Despite a history of land misuse, the natural beauty of this territory is not lost today. Pictured here are the tree’s mid-fall in Serpent River. Garden River First Nation by Cara Loft. All rights reserved. Garden River First Nation is located near Sault Ste Marie and is a largely Anishnabeg community. With roughly 1,100 band members, this community sits mainly along the St. Mary’s River and Highway 17B passes through their traditional territory. There has been dispute over Highway 17B and its passage through the Garden River Community, mainly due to the deaths of community members on this road. In April of 2016, band members from Garden River closed down highway 17B for a day to highlight the meaningless accidents and tragedies that happen along this highway. Pictured here is the old rail bridge over Garden River, and a written affirmation of who the traditional title holders and protectors of this territory are. Zoe Todd is a lecturer in Anthropology at Carleton University. A Métis scholar from amiskwaciwâskahikan (Edmonton), her work spans the subjects of human-fish relations, Indigenous philosophy, feminism, art, and the important role of Indigenous legal orders within the legal pluralities that shape Canada. 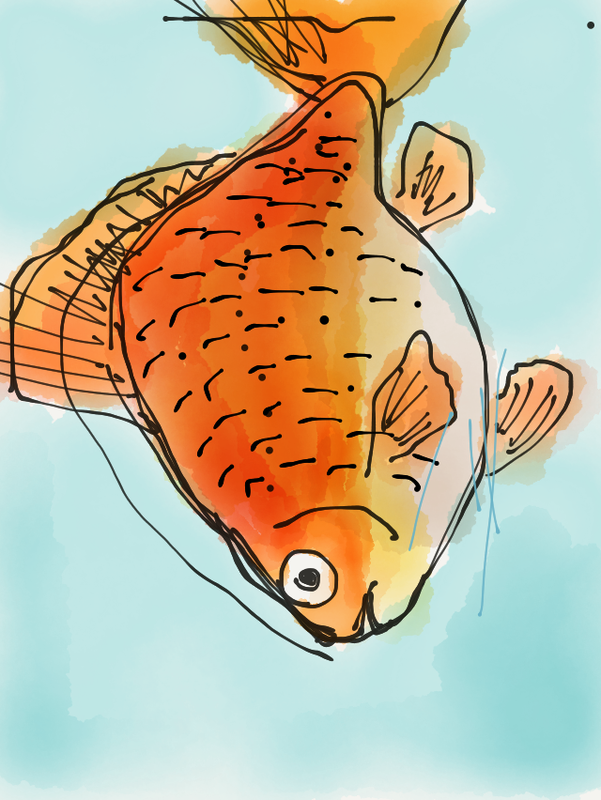 Her series of ‘Fish Friday’ images (posted every Friday on her website and Twitter account) explore the fish stories that and creatures that have shaped her more-than-human relations web of relations. 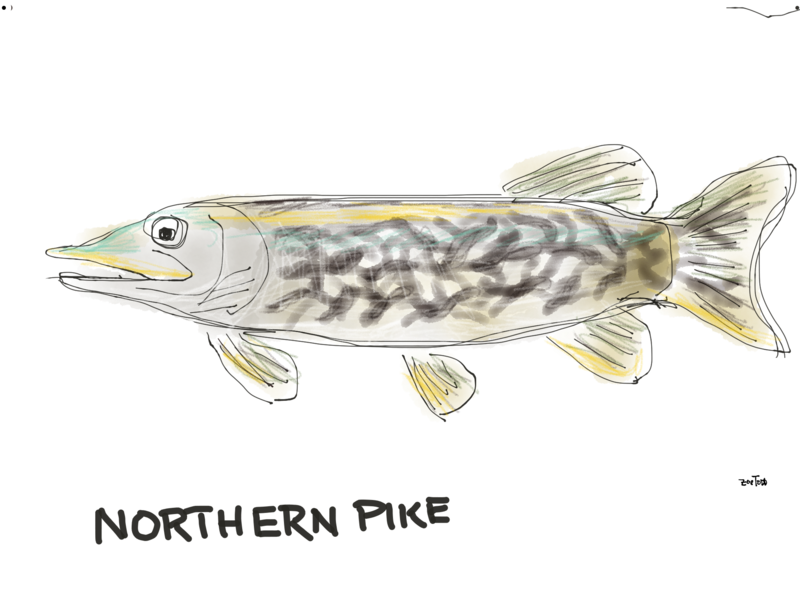 Northern Pike by Zoe Todd. All rights reserved. Image by Zoe Todd. All rights reserved. 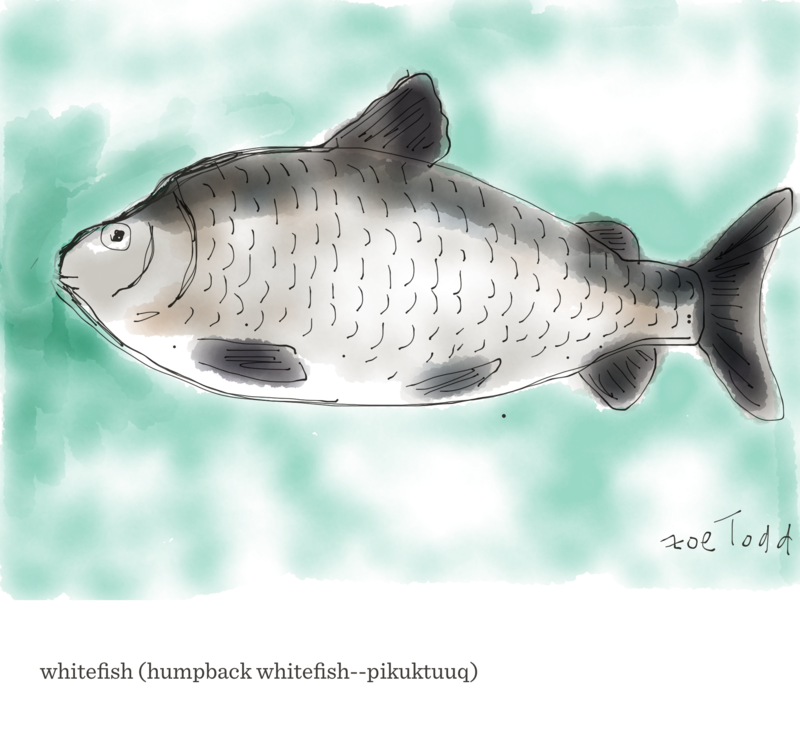 Whitefish by Zoe Todd. All rights reserved. 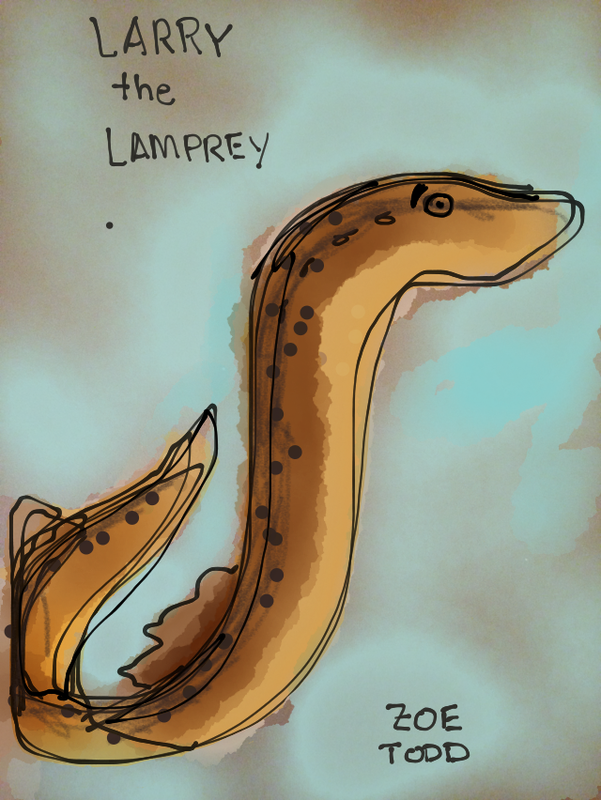 Larry the Lamprey by Zoe Todd. All rights reserved. 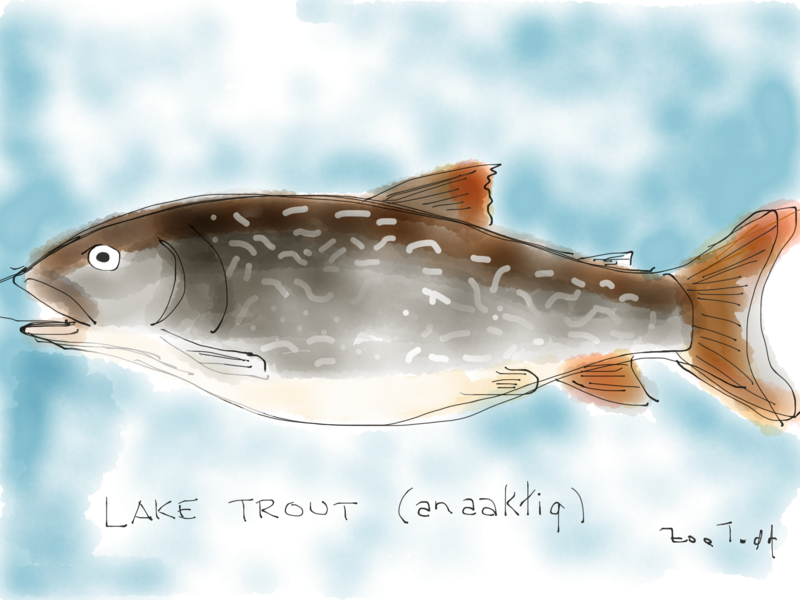 Lake Trout by Zoe Todd. All rights reserved. 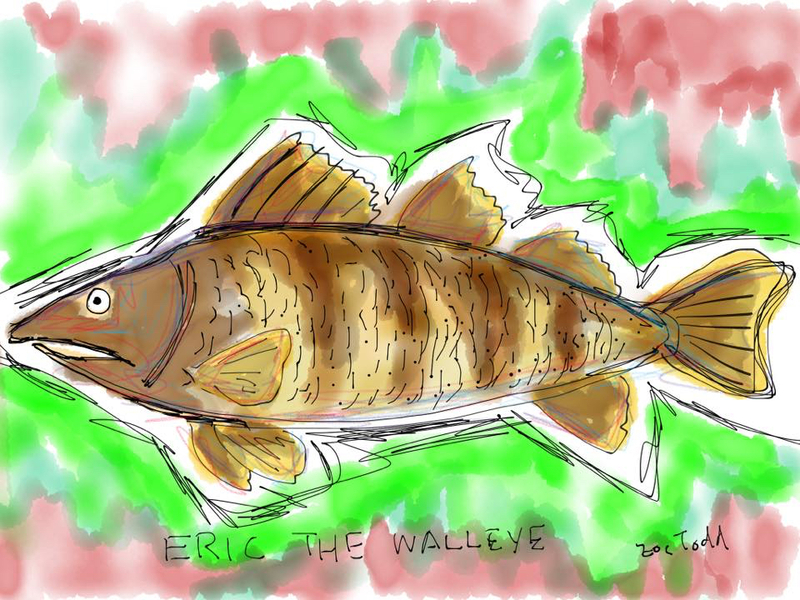 Eric the Walleye by Zoe Todd. All rights reserved. 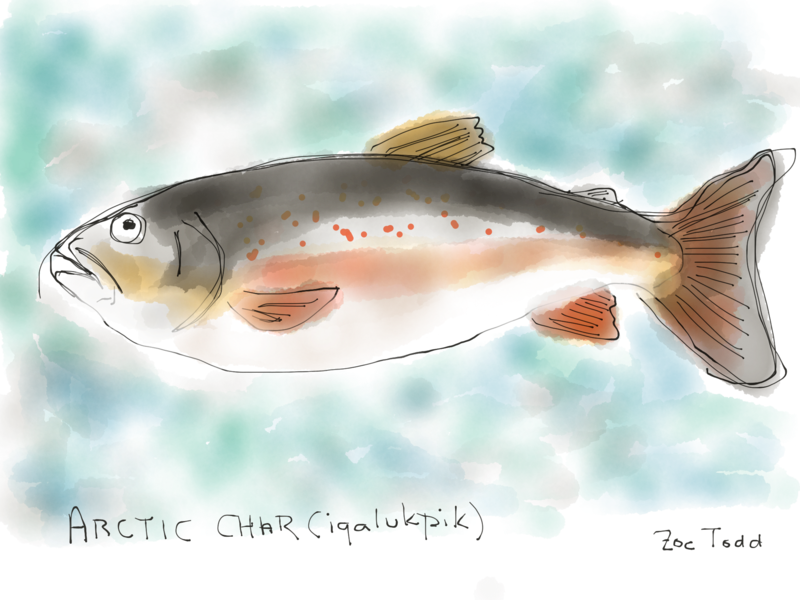 Arctic Char by Zoe Todd. All rights reserved. This entry was posted on Friday, May 27th, 2016 at 5:49 pm	and tagged with Indigenous philosophy; decolonisation; global ethics; extinction; ecology; workshop; Waterloo; Balsillie School and posted in animals, anthropocene, colonisation and settler colonialism, cosmo-visions, ecology, extinction, feminism, global ethics, harm, Indigenous, land, Country, plants, plurality, posthumanism, temporalities, Uncategorized, violence. You can follow any responses to this entry through the RSS 2.0 feed.